…Is it spring, is it morning? I tried to get a little closer to reality with this sketch, as opposed to the last one. I still need to learn about artistic license, details to delete, and tons of other things, but I’m really enjoying working outdoors. I’m loving the swing out back for this, because the tree gives me lots of shade on warm afternoons, and the swing arms are great holders for my water jar. Working from that little Cotman travel palette is great, because you don’t have all that many colors to choose from, so you have to get creative to get a variety of greens, for example. I’m finding that to be a good exercise. One of the things I really love about watercolor is mixing colors. I managed to scare away two little bunnies upon my arrival, but maybe they’ll hop on by again tomorrow for a visit. Yes, Monday is here in reality, but we can always conjure Friday in our minds to keep a smile brewing and that tailfeather moving! Have a beautiful spring week, and I hope you go make something today. Peace. Thanks, C! It’s so peaceful out there. Oh so beautiful, peaceful, serene. Perfect touches of watercolor. Did you use the microns? I feel like I’m there. And I want it to be Sunday again ! Happy Monday! Haha, no doubt! Yes, I believe it was the very fine Micron. I find ink adds a lot to these little sketches. Really gives the definition they seem to need. Have a great week! I’m glad, Kirk. I’m trying to get closer to realism…..we’ll see. Haha! I would have to agree with you, this painting is better than “the last one.” 😀 Keep up the good work though!! Great stuff you post here. Painting and sketching outside is so wonderful! you’ve done a good job of mixing the microns with the watercolor, and a good job on the tree. You might want to consider (on this or the next painting) to make one side of the trunk darker and damp down the edge of the color (so you don’t have a sharp line) so that it looks more rounded and then on that same side, wash a light blue wash over the ground for it to be the shadow of the tree. Thanks, Rachel, that’s good advice! I saw the shadow on the ground but it was a darker green, and uneven, and so I decided to skip it. 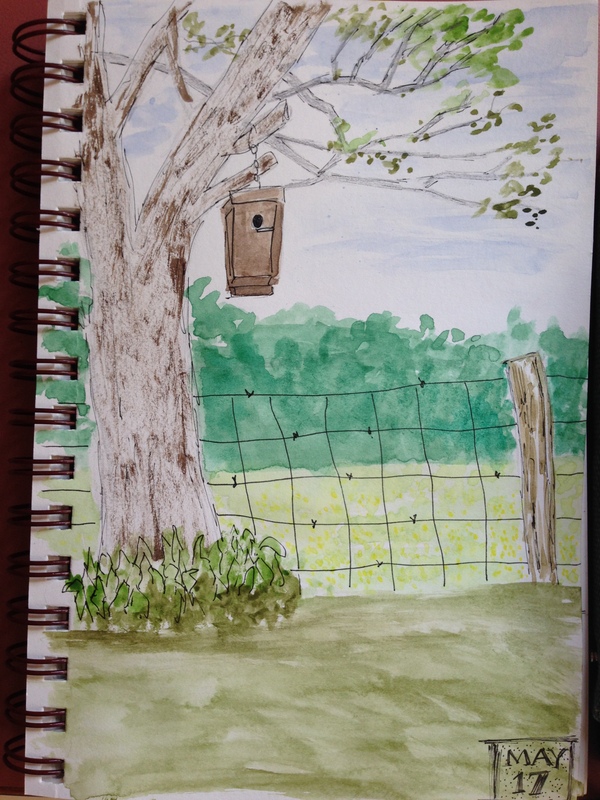 The other issue with these outdoor sketches I’ve done so far is they are in my art journal, so they are on 100# drawing paper, not WC paper….so I definitely don’t seem to get the same effects I’d get in a typical painting. I should try this in my WC journal once, just to see. Working with the tiny brush is also a factor, lol. But if I were working in the WC journal, I could use the larger brush, because it could take the additional water. Thanks again! Laura, you are so right. The paper and larger brush will make all the difference. Keep going–you are doing great! Thank you, Rachel! And I really appreciate your constructive criticisms. It’s the only way I’ll ever get better without it taking a lifetime lol. Me too! I have seen one at the lake that I hope to take a photo of and paint. I’ve taken photos, but they look like little specks. Photography is not one of my gifts, and the best camera I have is my phone lol. I’m looking forward to seeing your bunnies on your blog! The one at the lake is used to being around people I think. It was munching away on the clover and didn’t run away too quickly. And I have a really nice camera that I’m still learning how to use – I think the phone cameras are pretty good these days too. What a wonderful place to create. Thank you for sharing your special place. Thank you so much for that very kind comment!! What a beautiful, happy post!!! Love it and the atmosphere it creates in my mind. It made me smile. 😊 You must have a very pretty garden! Wonderful picture, and great palette of greens! I find mixing watercolors daunting; I admire your fearlessness with it! 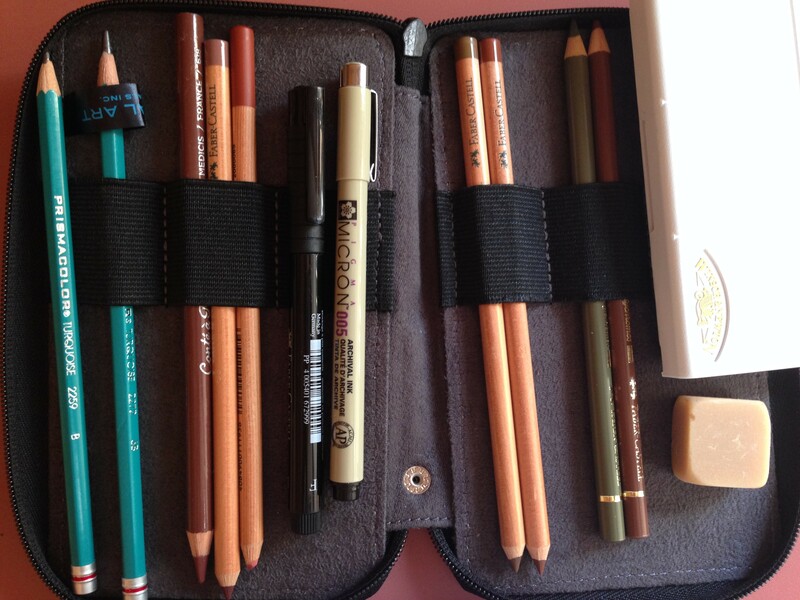 So true about the cotman travel set. I used to take that everywhere and always got stumped on greens. Haha too blue or to brown I always found 😉 love what you have done here and really like the little barbs in the fence. Really cute detail! Thank you so much! 😀 That set is the best. I’m glad you liked the little barbed wire add. hehe! I find the color mixing a challenge too when you start out with a limited palette. You’ve got a nice variety of greens here. Thanks. I was mixing burnt sienna and burnt umber and I think even raw umber (or is it ochre, can’t remember) with each of the the greens (viridian and sap). Amazing how many convincing greens you can make!